I’ve done a “best of” selection at the end of previous years … but this year I’m opting for a favorites list. I didn’t realize there would be a disparity between the photos I consider my best technically versus those I hold close to my heart. There appears to be only a loose correlation between the merits of an image and my feelings about it. With that in mind, here’s my list of 2013 favorites, some of which do appear in earlier blog posts. 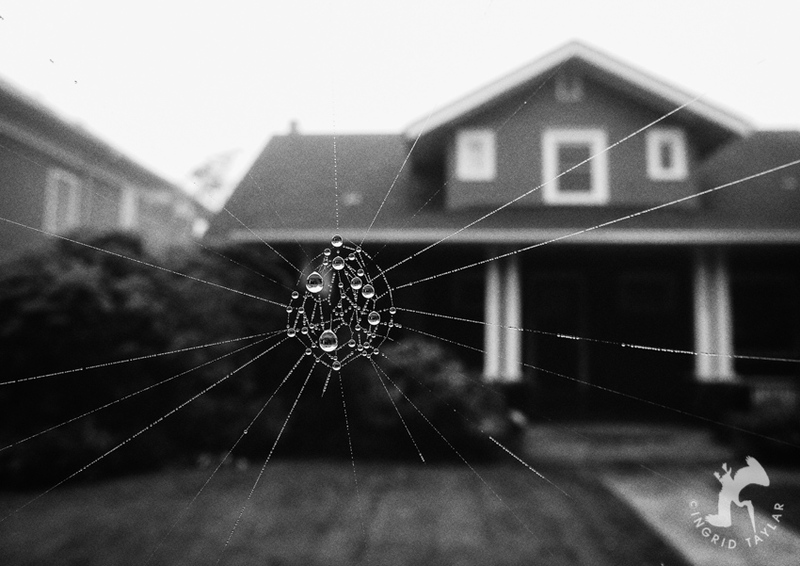 I’ve included the stories behind these photos and why they were memorable for me this year. HAPPY 2014, EVERYONE! WISHING YOU A SPECTACULAR YEAR AHEAD! 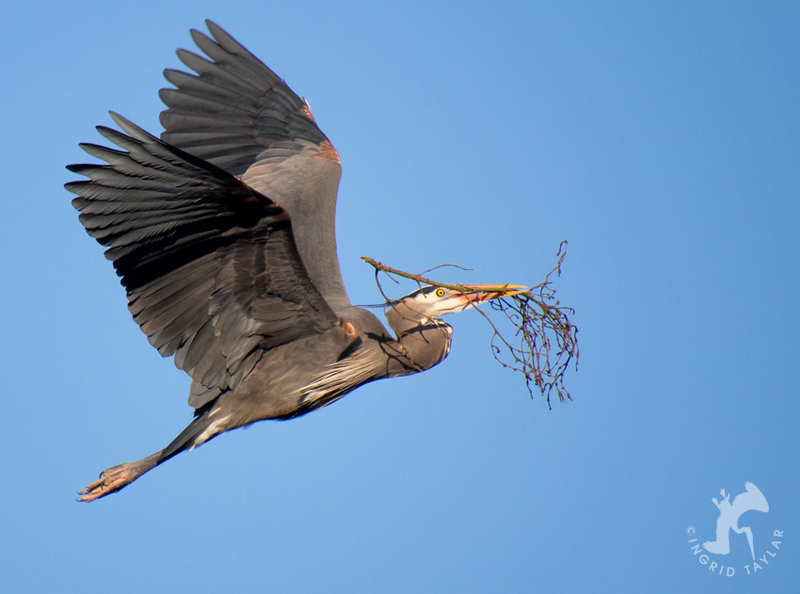 I wrote about these Great Blue Herons in the context of rebuilding and renewal. They’d lost their rookery, up the ravine, to the marauding of a young Bald Eagle. I didn’t know the story when I photographed this heron, but I knew something was amiss for them to be building so late in the season. When I discovered they were beginning all over again in a new location, with new nests and new eggs, I couldn’t help but be inspired by the diligence so often prevalent in wild animals, qualities that can inspire my own choices if I let them. I shot this just days after the young Osprey fledged. I’ve been following several Osprey couples and their offspring since my first spring in Seattle, and this youngster grew up in the nesting platform closest to our apartment, at the Ballard Locks in Seattle. He was born with a sibling, photographed by just one local photographer as far as I know. But after the first week, none of us saw the second bird and are not sure what fate befell the baby. Midway through the nesting season, the adult male seemed to disappear, at least part time. For a week or two, the female seemed to be fending off attention from other Ospreys who regularly landed in the nest but were clearly not her mate. There were some harmless scuffles, and I wasn’t sure where the chick would fit into those territorial discussions. A few of us observers took regular photos, trying to discern if, in fact, the original male was there or if she’d taken up with a new male. We never did figure it out definitively but I believe this is original male. He spent a lot of time with the fledgling, helping him land on the nearby railroad bridge and bringing him fish. When our dear Jackie kitty passed away, we took a short road trip to connect with coastal and oceanic nature. Before we left, a dear, ethereal friend of mine was insisting that butterflies, rainbows and feathers are all comforting signs when our loved ones pass away. They will find you, she said. On one hilly walk, we came upon this Mylitta crescent butterfly. She followed us down a trail and landed next to us. 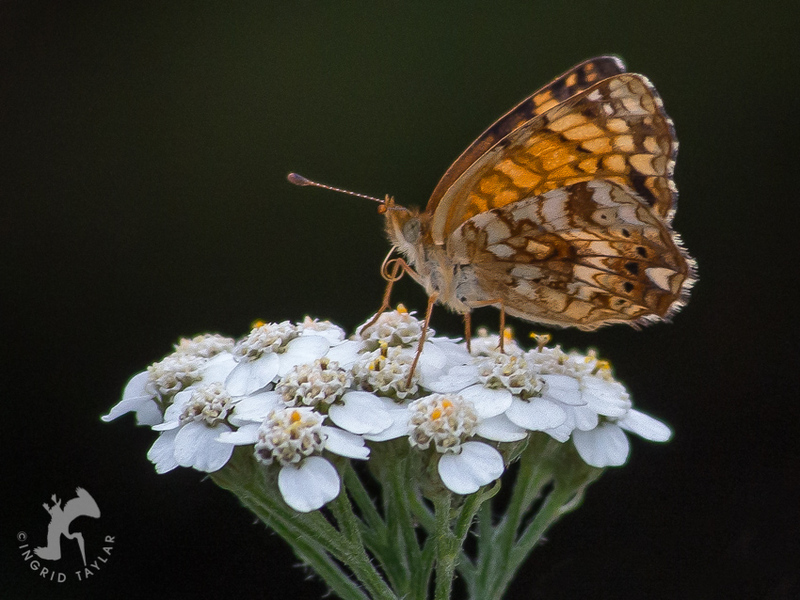 She was the only butterfly we saw in the vicinity and was so tolerant of our lenses, she never budged despite our many movements. She stayed still even as our shadows enveloped her, something that usually spooks butterflies. And she actually turned in the light to give us different poses. I remember saying to Hugh, okay, no matter what the inspiration here, I simply can’t away from this butterfly. So we didn’t. We stayed in her space and she in ours. Finally, we did have to leave so I thanked her and told her we were moving on. She started flapping, then moved to a plant a few feet behind us. Whatever that butterfly’s motivation, it was a touching moment to be in peaceful presence with a fellow being of different dimensions, at a time when we needed that connection most. This is another shot, as many are, born of unexpected circumstances. 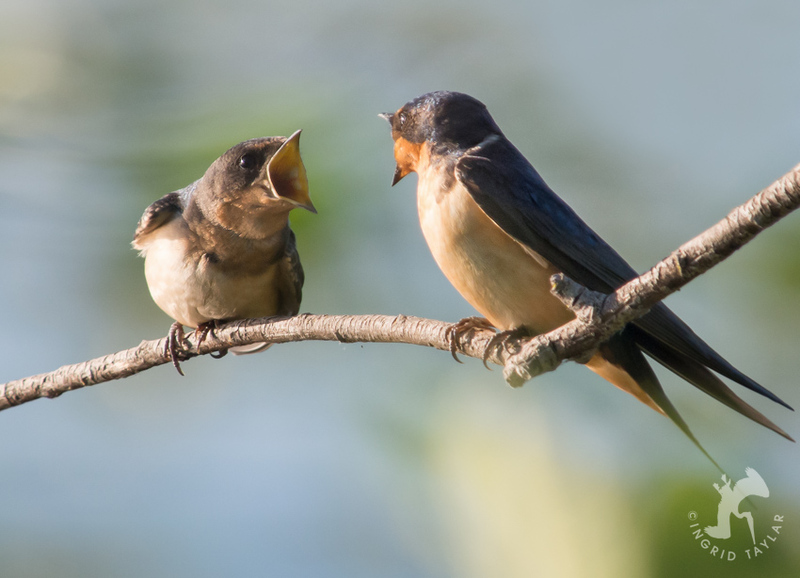 We were photographing at Juanita Bay in Kirkland, across Lake Washington from Seattle, and we encountered a small group of Barn Swallow fledglings. I’d tried to photograph some Barn Swallow fledglings in a different location just days earlier, but my older E-3 camera was acting up. I couldn’t get an in-focus, sharp shot to save me. So, this time, I brought my micro four thirds camera and 50-200mm, deciding that manual focus was better than no focus. I saw this young bird perched on a branch over the lake and as I zoomed and focused, an adult landed next to the baby, creating this moment of communication. The adult had no food for the young one, despite the baby’s pleas. Later, however, another adult did arrive with an insect meal for the young one. 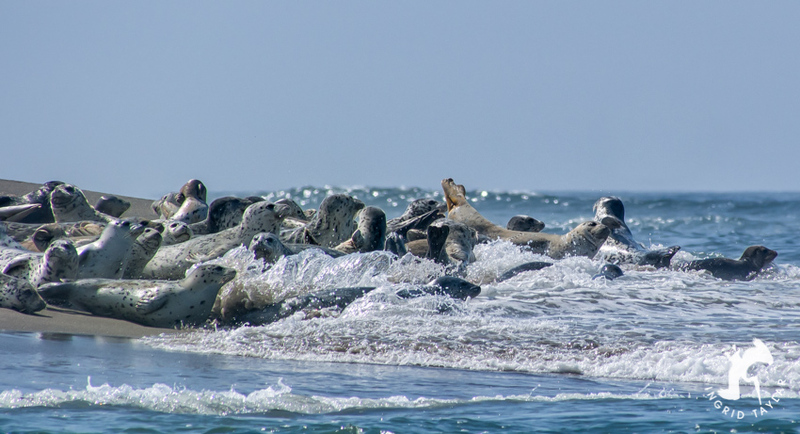 On the Oregon Coast, we came upon this harbor seal haul out area at Lincoln City. It was a pinniped party as power waves crashed against this sandbar, eventually swallowing it up to a point where the haul out disappeared until the next low tide. It was a pure joy watching the seals flow with the force of the water, sometimes succumbing to the push and gliding under the surf, and sometimes clustered together, buffeted by the water but holding their sandy ground. My friend Elaine clued me into the location for this shot. We were photographing Ospreys and she scrambled up to the railroad bridge for a better view. This is an active rail line but a nearby drawbridge rises frequently during boating season, rendering the tracks inoperable during those times. 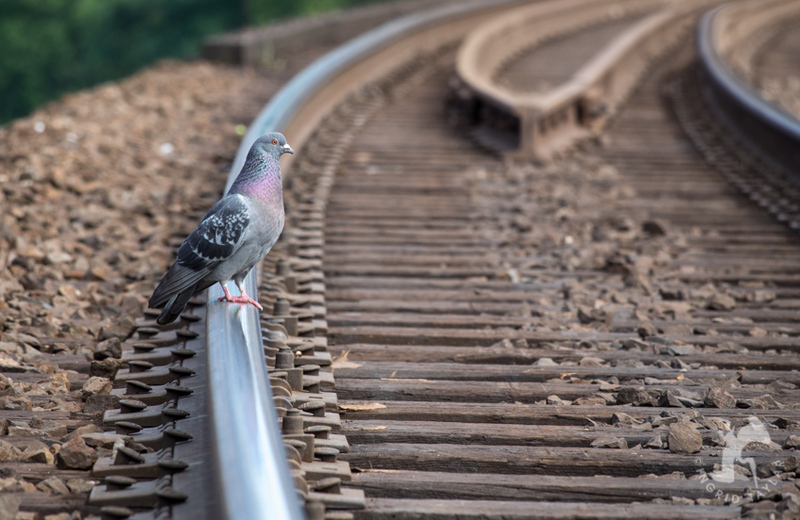 Pigeons nest below and sometimes forage for scraps around the tracks. I saw this pigeon and immediately thought of the film The Station Agent — and walking the right of way. I was hoping for this shot, so technically it’s not a photo bomb. 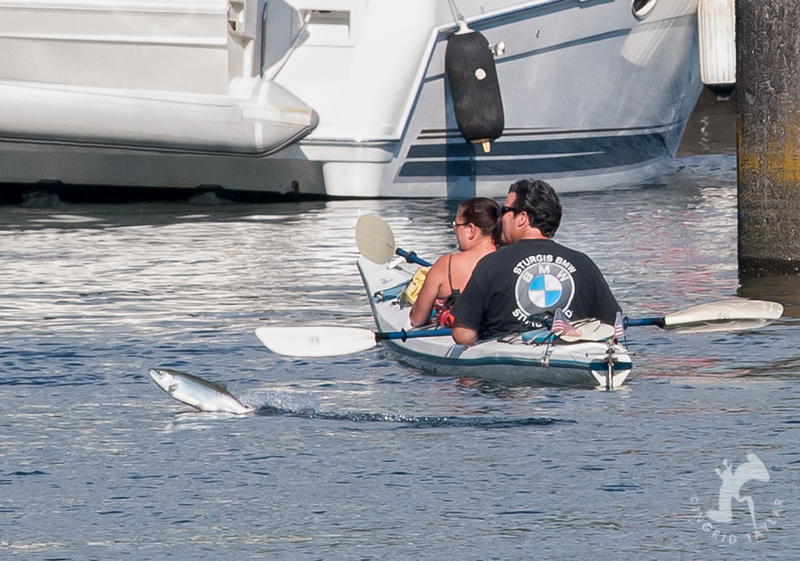 I saw quite a few salmon jumping at the Ballard Locks, where boats pass from Puget Sound to the Ship Canal to Lake Washington. It’s also the location where I photograph salmon climbing the fish ladder on their way home to spawn. I pointed my lens in the direction of the kayakers, wondering if a salmon might leap into frame. He did, and here’s the shot. What a wonderful set of images and stories for 2013 Ingrid. I wish you all the best for 2014! Moving photographs Ingrid. All of them. More moving however, are your stories that go with them. Just a few comments. 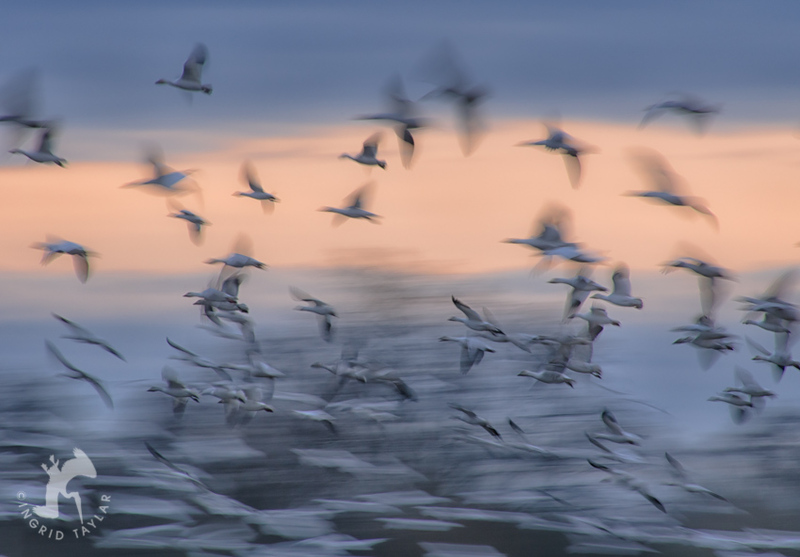 I loved the Ghost Geese when I first saw it on your post. It really captures the essence of waterfowl and their habitat. 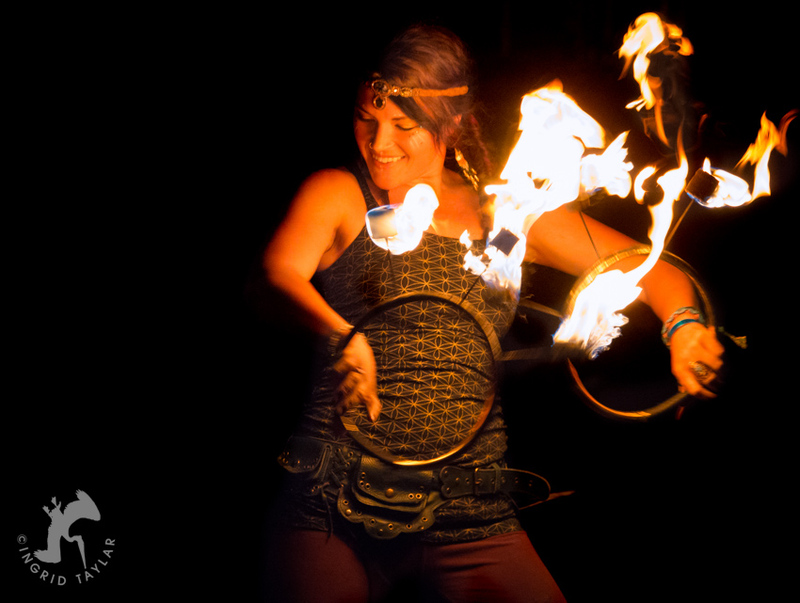 The fire dancer is trance-like and the young gull I remember from the rooftop as well. Very cool shot of the mirrored fishing Egret and I agree with Hugh about the period piece garbed intruder for the fog photo. Being an avid birder, I remember well “The Great Blue Resilience” and your image here is so beautiful, brilliant and sharp, I love it! 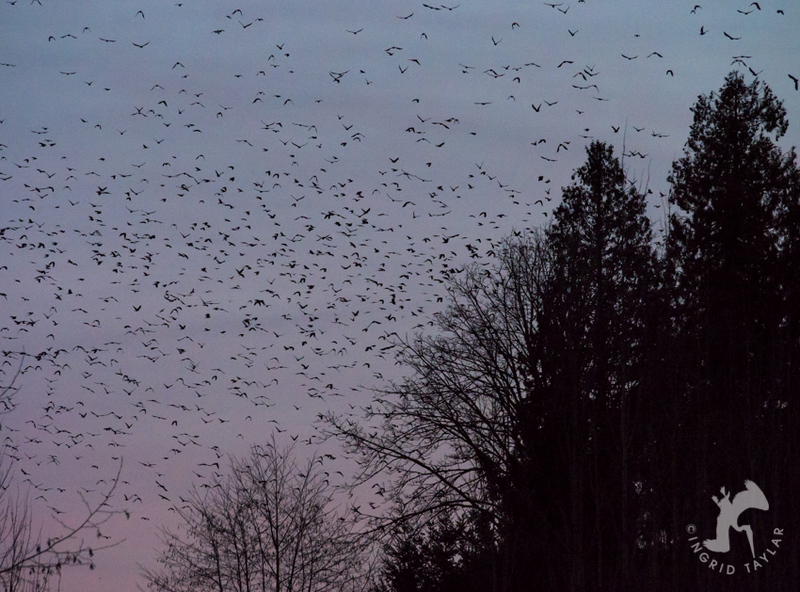 Your description of the 10,000 birds blackening the sky made me want to travel back in time to that period as well. Your description of the little girl in the boots touched my heart and I know yours too. 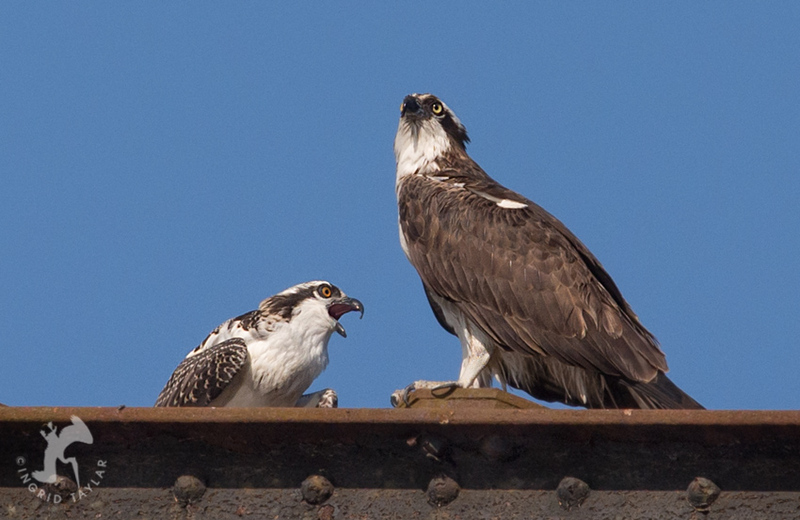 I need to go back and read the post on the Osprey but I really like the father and son shot. 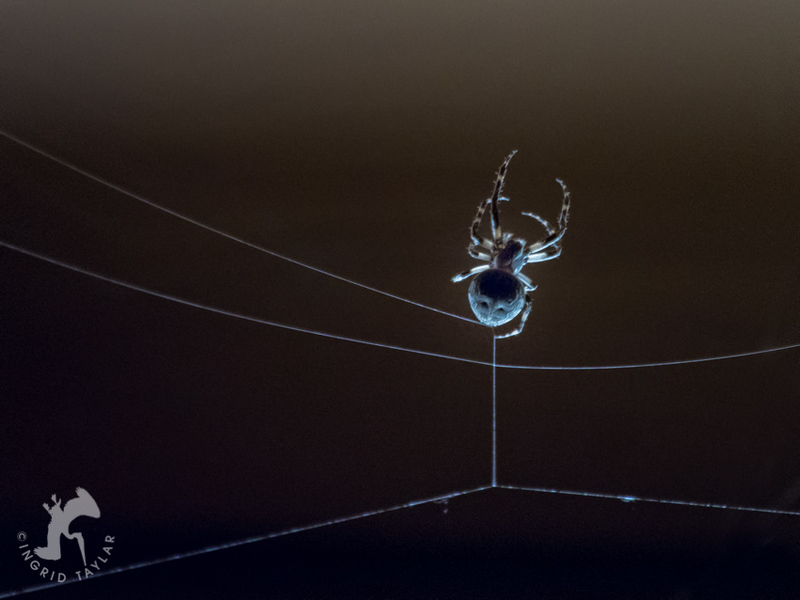 Cool spider shot and the webs in the dew that comes later. I can’t even imagine how important that butterfly experience was for you, and very possibly for the butterfly as well. The image is exquisite. The gaping swallows are really cool and so familiar to me, it makes me anxious for breeding season to begin once again. 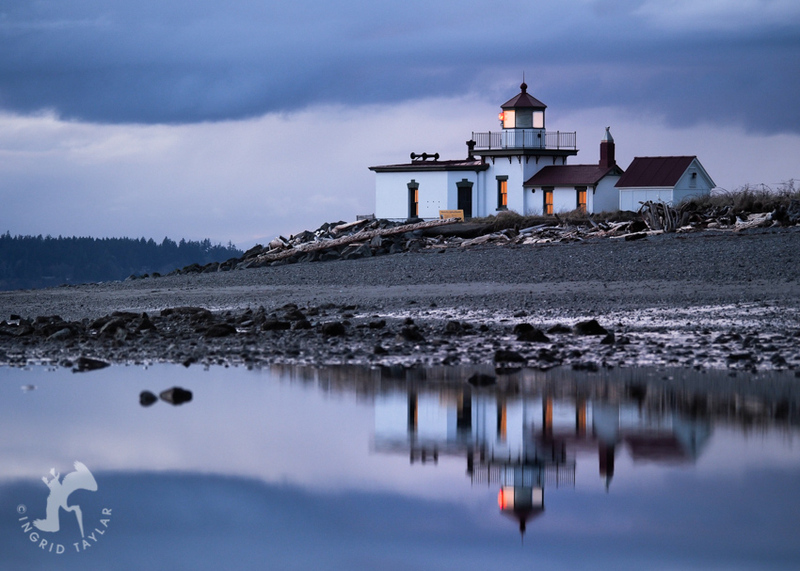 The lighthouse reflection should be in a book, magazine or tourist brochure – something. It’s beautiful. Your description of the “Waves of Seals” made a movie out of the image for me. The lone pigeon on the track is interesting but the salmon shot is amazing. Before reading your description I thought it was serendipitous but actually the fact that you waited and purposefully took the shot is more inspirational. 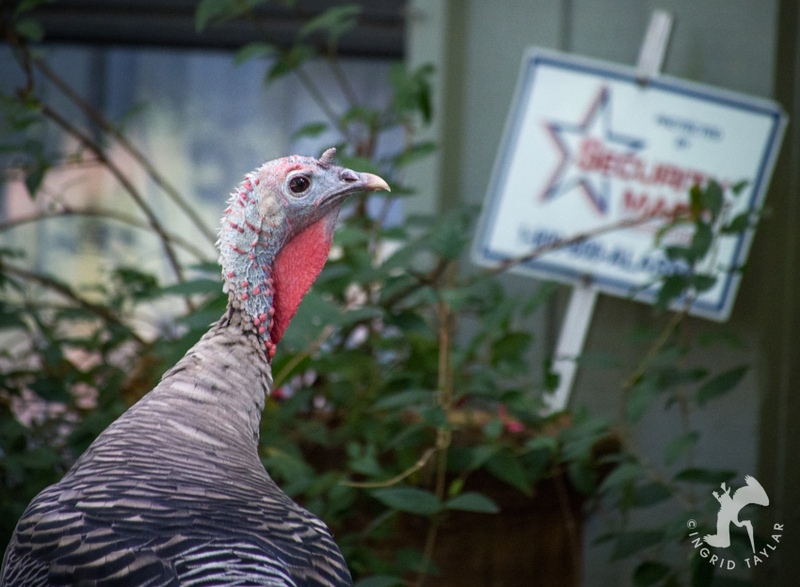 Last but not least, the Wild Turkey with the perfectly blurred security sign conjures up all kinds of captions! Thanks for the year’s repertoire and I hope you have a very Happy and Prosperous New Year! 1. 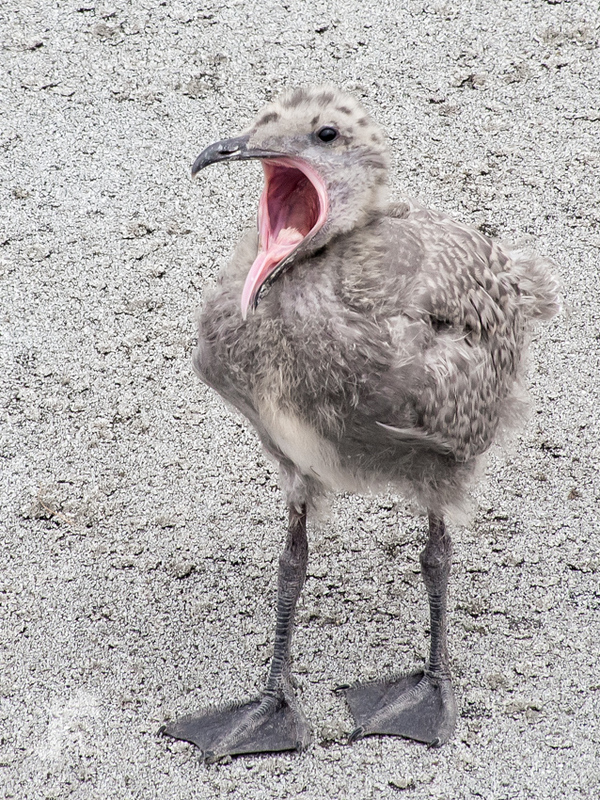 Gull Chick Colony — A creature (especially a baby) yawning confirms my feeling that there is no meaningful difference between humans and other-than-humans, so let’s please get over ourselves and include all fellow-beings in our circle of compassion, care, respect, love, and gentle justice. 2. Building On — I distinctly remember this blog and my feeling of awe at the Great Blue Heron’s “resilience” and “diligence.” So glad to be reminded of the quality of unflagging perseverance, which conquers all the disappointments and distractions, the hurts and fears, that would, if they could, take away our (and the herons’) natural joy. Like this heron, we each have an unselfish purpose to accomplish, and *nothing* can deter us from doing it. 3. 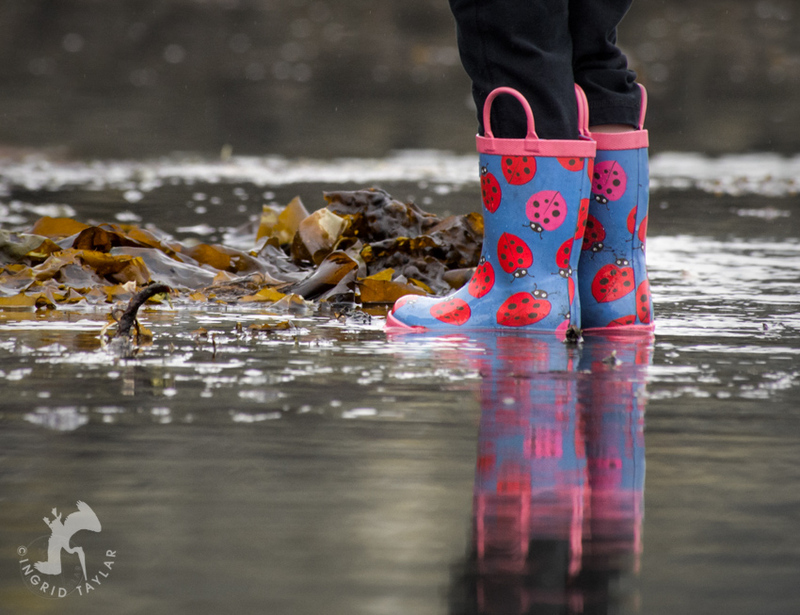 Low Tide Boots — The ladybug is the creature I associate with my first of four beloved boxers. Cassius was a magnet for ladybugs. Wherever we went, his presence drew them to us. Also, the lone pink insect in a sea of red bugs on each boot — and the way her color matches the pink edging and handles at the top of each boot — appeals to my eye. As a little girl, I loved to dress my Mary Poppins paper doll in a pink-and-red outfit, so I have visions of Mary Poppins with her umbrella dancing in my head! Finally, your description of the little beachcomber’s sweet consideration for each sea creature — either taught by her father or taught by her TO her father — melts my heart. 4. Butterfly Visitor — Your encounter with this beautiful butterfly (alighting on an equally beautiful flower) reminds me of the special butterflies in my life, each of whom has been both a unique individual in his/her own right and an angel messenger bringing me reassuring, comforting news. One was a yellow Sulpher butterfly, three were Monarchs mariposas. So it brings me peace to think that the Mylitta (my little) crescent represents your Jackie assuring you that she is ever with you — even “growing” or “increasing” (which is what the Latin verb CRESCERE means) in your hearts. 5. Waves of Seal — First off, the seals are so cute and cuddly. But more important is the two-fold message I glean from this photo: at times they acted alone, expressing their individuality by leaving the huddle to flexibly flow with the current, and at other times they all stayed in a tight-knit group and together maintained “their sandy ground,” as you put it. The latter reminds me of this metaphor: when sticks are tied together in a bundle, they cannot be broken. 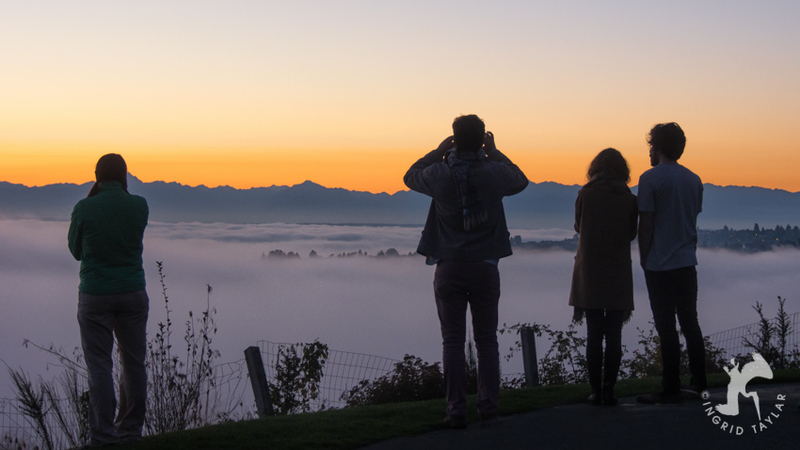 Each of us can listen to the “still, small voice” telling us when to leave the crowd and venture out on our own, and when to act “of one accord” with our brothers and sisters. 6. Home Security — You must have written about the wild white gallapavo flock before I discovered your blog, Ingrid. I’ll click on that link as soon as I finish writing this comment. As one who no longer eats animals — they are now friends, not food — I feel special affection for any and all beings who are enslaved and exploited by humans — and, in this case, for the free-living cousin of those poor commoditized and killed beings. Thank you for photographing and blogging your way into my home and my heart last year, Ingrid. The priceless gifts you’ve brought us — the wondrous beauty of birds as well as the technical details of each frame and the emotional dynamics of each scene — will stay with me always. I so look forward to seeing the new discoveries — new proofs of life and light and love — that await you. Ooops, I see that I did catch the gallapavos — it was only two months and one day ago that you posted it. Sorry about that! 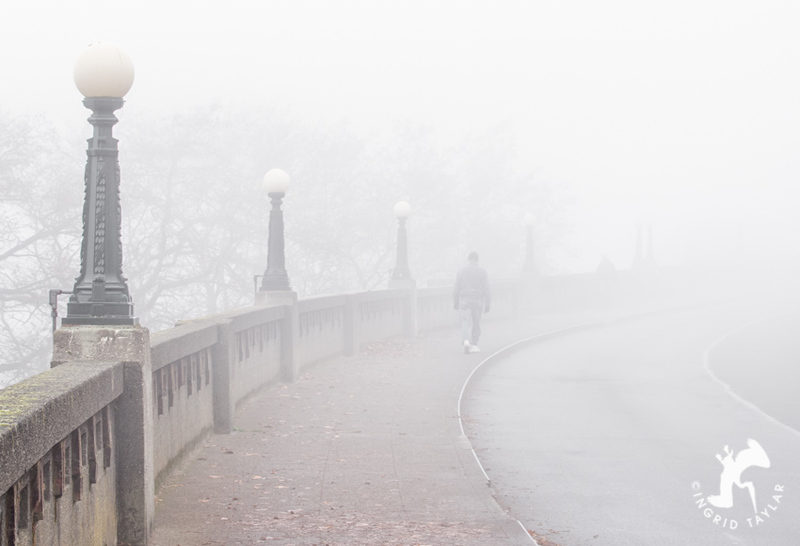 But while I’m here, I’ll mention that I, like Larry, like Hugh’s idea of putting someone in a period costume into that foggy photo. 🙂 Love your “Japanese paper cut art” analogy. My favourite ones are The Spider Gateway; The Butterfly Visitor; and Building On. They are all great quality; the detail of the butterfly is top notch. Also, thanks for the letter to the editor you wrote about the TIME article. That is the proper etiquette and way to proceed in these matters. My outraged ‘human’ part couldn’t conceal itself, however, and had to let it out. Ingrid, I spent quite a while perusing these photos and thoroughly enjoyed each and every one of them. I like the variety of the subjects you shoot (something missing in my own photography). I couldn’t agree more about the disparity between our shots that are best technically vs. those that are our emotional favorites, for whatever reason. And I love that you sometimes “thank” your subjects after a photo session – something I do regularly with birds. . .
Love the photos – Many of which I had not seen before. The Ladybug Boots are precious and a great contrast to the earthtones. Home Security is a hoot! 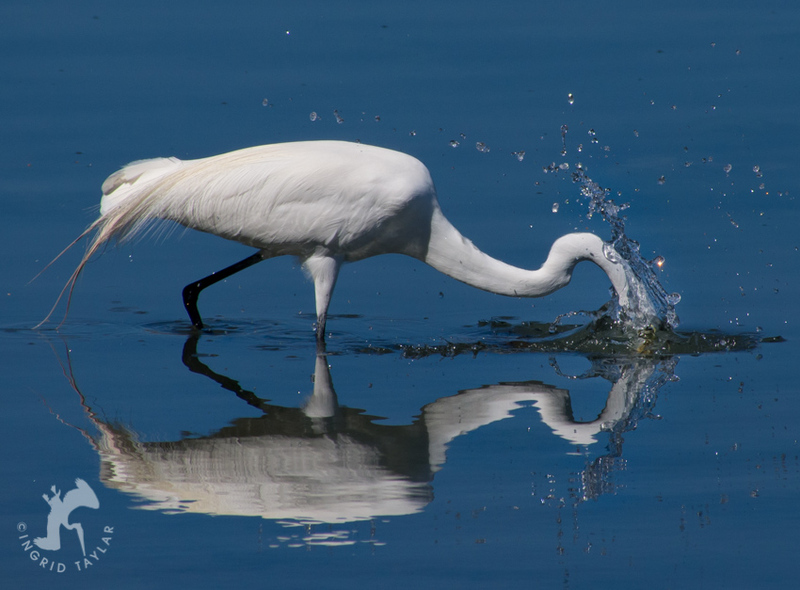 And my favorite, the Fishing Into A Mirror, title and image is so perfect!